Lizzy Schule looks at new work by Kara Taylor. Less than a mile apart, the summer shows that opened at the galleries owned by Allen Whiting and Kara Taylor on Sunday night offer a fresh collection of something old and something new from two well-known Vineyard artists. Looking Back is a retrospective of Mr. Whiting’s long-running career that includes vivid, brushy oil landscapes, self portraits and sculptures. Ms. Taylor’s New Paintings places the focus on her most recent work — largely gilded, layered, mixed media pieces. Though Mr. Whiting’s show is a survey of his old work, some of what is on view has never been seen by gallery goers. The sculptures are a novel addition for Mr. Whiting. He has been making them for more than 20 years, but is showing them for the first time. 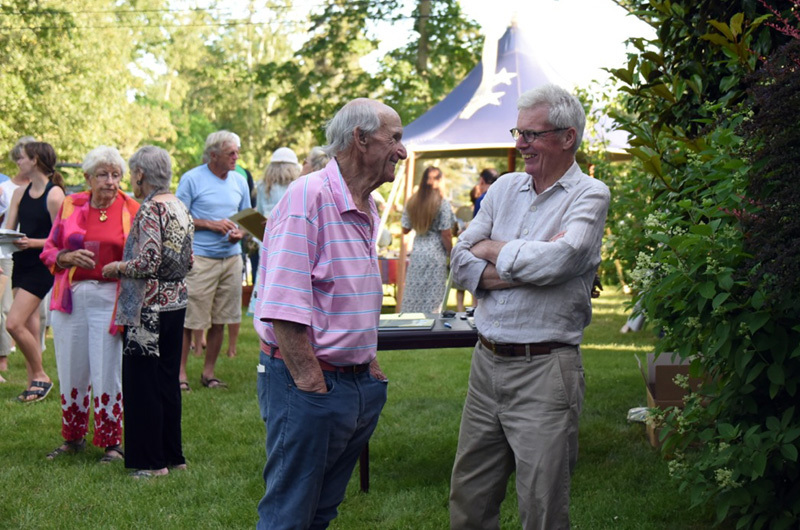 “This is our 35th year doing this gallery, and we decided that we would try to do something a little different, a little more interesting,” he said at the festive opening at the Davis House Gallery on a summery Sunday evening. The sculptures are assemblages, primarily made of brick. The sole exception is a large, stone-topped block. Some of the bricks are painted with abstract smears, others incorporate found objects in revelatory ways. The show includes seven self portraits, also rare for Mr. Whiting. The portraits drew considerable praise from the crowd circulating throughout the rooms of the gallery. 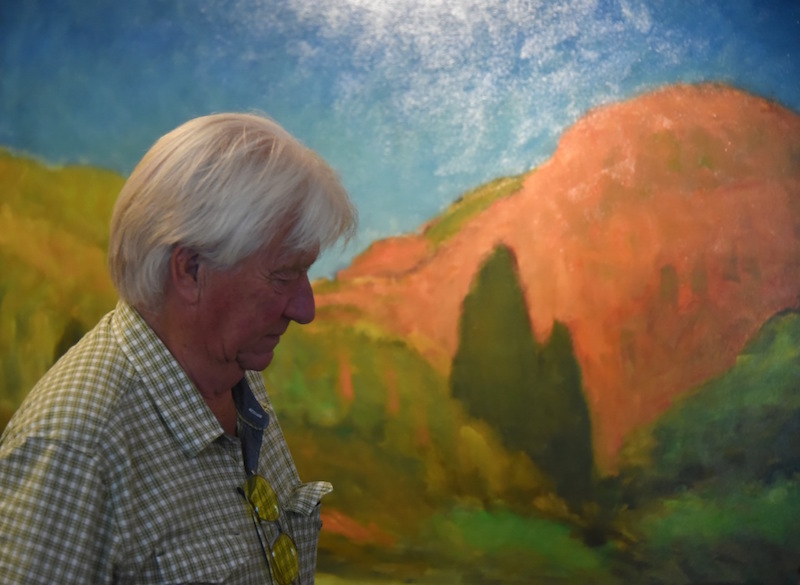 Mr. Whiting’s landscapes take the viewer on a journey from the American southwest to New England to Saint Vincent. His smaller canvases — some are petite 6-by-6 or 5-by-7 compositions — invite the viewer in and then open up into melting strokes and daubs. By contrast, Ms. Taylor’s paintings explode outward from the surface. The paintings are built up with additions of wood, lace and other textile appliques. Many of the works are gilded, adding a reflective dimension. Ms. Taylor said she created the new paintings from October of 2016 to January of 2017. They are splashy and eclectic, drawing on varied sources for inspiration and materials. Grounding the new works on view is her latest addition to a popular series. The response of visitors on Sunday to the newest flowers indicates she might have to keep up with the series for a while to come. The panels are reminiscent of tapestries both in their long, rectangular forms and in their use of woven materials. “You must have a bottomless supply of lace,” one guest commented to Ms. Taylor. Most of the new paintings feature repeating floral motifs, though some also incorporate human forms. The faces Ms. Taylor paints are all angles and uncompromising stares. Some make explicit reference to religious iconography, as is the case with the painting Eve and Mary. Others incorporate nature into portraiture, such as in She Studies the Anatomy of Flowers and Woman Seated on Couch. 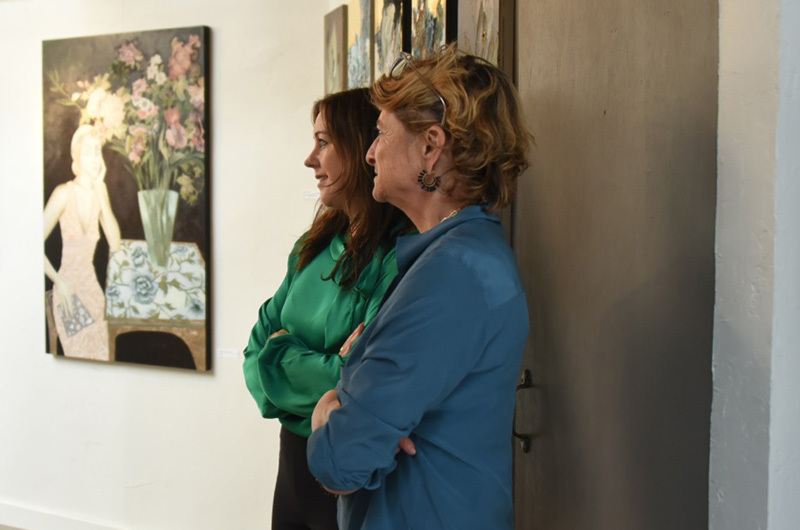 In addition to the new paintings on view in the back room of her South Road gallery, Ms. Taylor has on display older works, such as the Duck Decoy and Marble Landscapes series, in her front room. 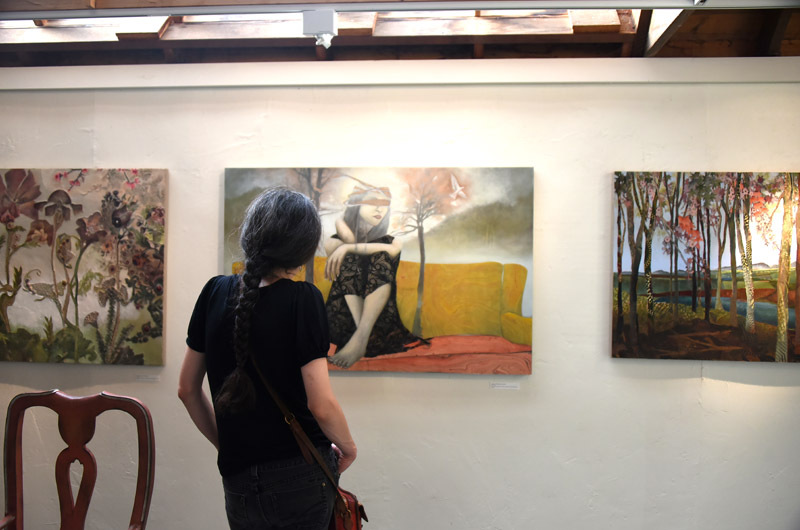 Gallery hoppers have plenty to feast their eyes on. The Davis House Gallery at the Whiting farm on State Road in West Tisbury is open Thursday through Sunday from 1 to 6 p.m. and by appointment. Kara Taylor Gallery on South Road in Chilmark just past the Grey Barn Farm is open Tuesday through Sunday from 11 a.m. to 5 p.m.